Whoever said toys are only good for children certainly never met Schildi the German turtle. Schildi was abandoned and suffered a traumatizing injury of one of his front legs. 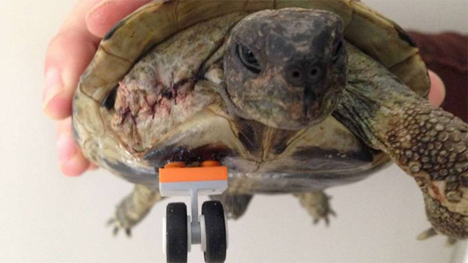 A group of veterinarians took him in and made him faster, stronger, and awesomer using LEGOs. 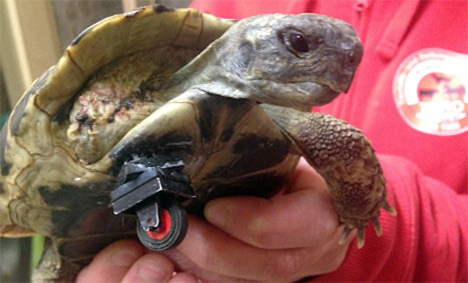 Following the amputation of Schildi’s damaged leg, it was apparent that he needed some kind of substitute limb to help him wander around. The vets raided the toy box of a small child to find the base bar, spacer bars, and wheels that they needed to carry out this cybernetic transformation. Using surgical glue, they attached the base plate to Schildi’s undercarriage. Then using spacer bars and LEGO wheels, they got the prosthetic to just the right height. A little experimentation revealed that a double wheel made it too difficult for Schildi to get around, so the vets replaced it with a single wheel which also appears able to pivot with Schildi’s movements. According to the vets, Schildi will need an upgrade on the wheel about once a year, which will be as easy as popping off the old one and connecting a new one. See more in Cybernetics or under Technology. November, 2013.